The Moonshare Cooperative began in September 2007. Its founder members met to pool their enthusiasm and ideas for a new UK Diary that aimed to be a network and resource for the Earth lovers, environmentalists, artists, writers and activists of our UK alternative community. We sent out a call for any artists and writers who would like to contribute, mostly drawn from our own friends, but quickly spreading out into the wider community. Originally we were to be a Moon Diary and we had the idea of selling 'Moon Shares' to raise the considerable sum needed to print the diary in full colour. These Moon Shares were in fact a loan, which we intended to pay back as soon as we were able. Some of the contributors to the original diary also very generously gave us a voluntary donation towards the printing costs and we valued these contributions enormously and the vote of confidence and support. In 2013 our aim to be financially sustainable and to pay back the Moonshare loans was realized. 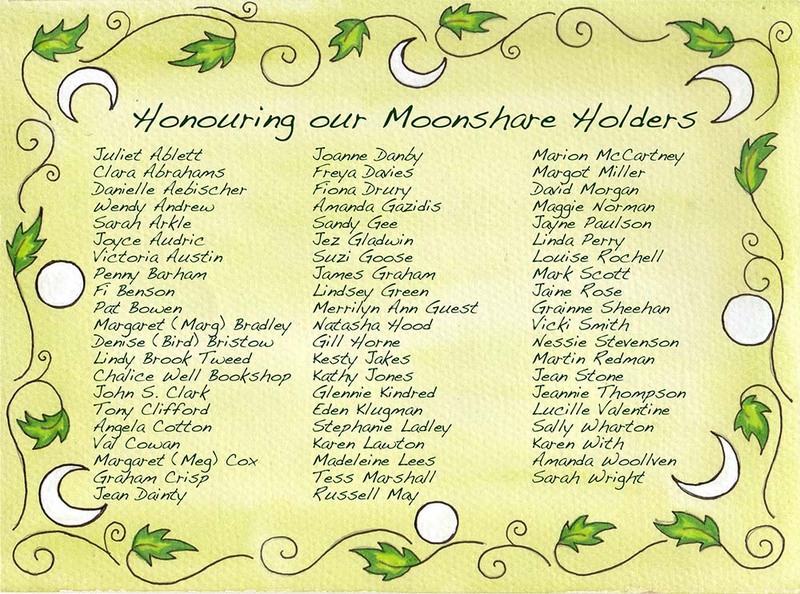 We wish to thank everyone who so generously bought 'Moon Shares' and we have celebrated and honoured them in a Moonshare 'Role of Honour'. We would not have got here without their support and faith in us and the diary. We are now registered as an Industrial Provident Society. All profits from the Earth Pathways Diary will return to the Co-operative for future projects that raise awareness and healing for the Earth. The team has changed over the years, as have our hairstyles and our company name, but our commitment and ethos stay the same - our desire to help inspire a connection to the land.